Splash page from #2 by Robin Smith. 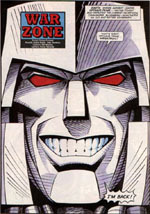 By 1994, Hasbro UK wanted a comic book to push the new G2 toyline in Britain, and planned a reprint title based on the American series. However, there were a number of problems. Firstly, Marvel's UK arm had collapsed after overreaching itself with a number of flash-in-the-pan titles, so instead Fleetway were contracted. It then became clear that a straight reprint title wasn't possible due to a couple of major reasons - firstly, the GIJoe lead-up hadn't been printed in the UK, and with that toyline dead in Europe, wouldn't be; and secondly the comic was to be pitched at a younger generation of readers, and the level of violence in the US material was unacceptable. So instead, the new monthly comic started off with a pair of in-house stories, drawn by Robin Smith and credited to Simon Furman - though it's still unclear whether Furman did have any participation or not. The remainder of the magazine was filled with profiles, competitions and the like. These two UK strips were quite different from their American relatives, most notably in featuring nearly all G2 toy-based characters. However, Transformers as a toyline had enjoyed a more steady decline in the UK than in the US, but this decline continued, rather than averted as it had in America briefly with G2. Not helped by distribution problems and such a small amount of story [just 12 pages a month], sales began as poor, and then quickly declined. Even the belated switch to printing US material from issue 3 onwards didn't help, as the comic struggled to find a young audience, with the fans who had grown up with the original UK comic unimpressed by the childish pitch of the magazine. After just five issues, Fleetway pulled the plug. 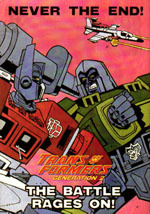 There was also a UK-exclusive Transformers Generation 2 annual, released around the middle of the comic's brief life. The final page of Issue 5.